A delegation from the World Bank (WB) with participants from the Philippines, Thailand, Russia, and China, led by Ms. Rebecca M. Oh, the Director of Global Practice Region Resource Management, paid a working visit to Vietnam National University of Agriculture to evaluate the effectiveness of the WB funded TRIG program after 5 year completion: "Educational and research capacity building in agricultural science and rural development at Hanoi Agricultural University" on May 30th, 2018. 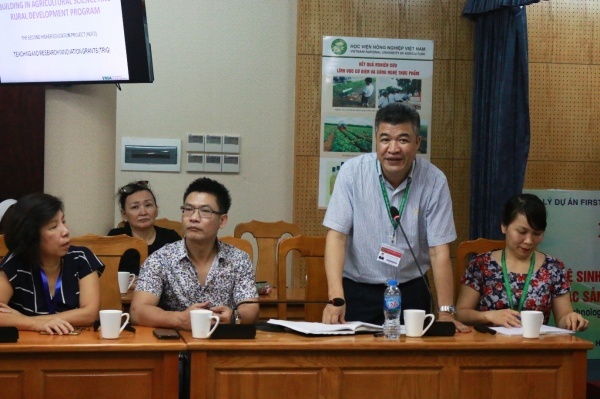 Prof. Dr. Pham Van Cuong, VNUA vice president, hosted the meeting with the participation of representative leaders of the International Cooperation Office and the Faculty of Animal Science and the Faculty of Food Science and Technology. 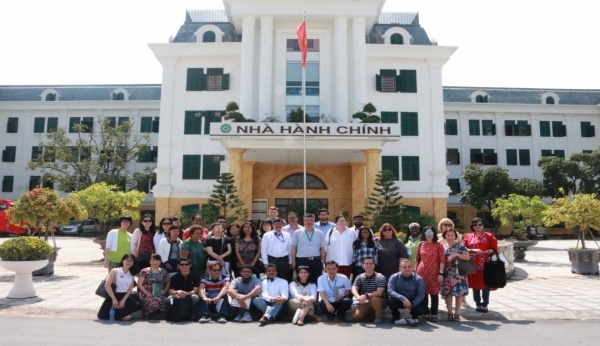 The overall objective of the TRIG program was to improve the teaching and research capacity in agriculture and rural development at Hanoi University of Agriculture (former name of Vietnam National University of Agriculture) in order to turn Hanoi University of Agriculture into a high quality teaching and research institution with a leading role in institutions of agriculture, forestry, and fishery in Vietnam, gradually approaching the regional and international levels, for efficiently supporting the areas of agriculture and rural development in Vietnam. 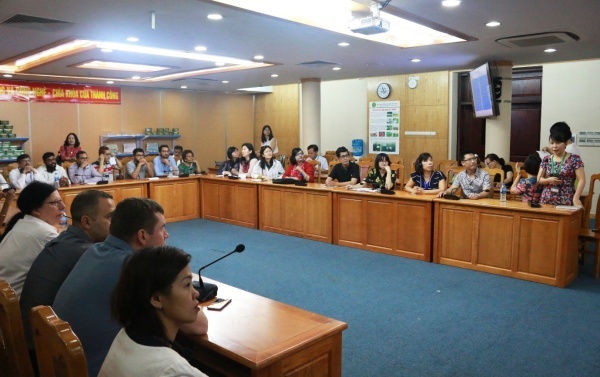 This program included five modules: i) Teaching and research capacity building in agricultural biology and resource management; ii) Educational and research capacity building in economics and rural development; iii) Teaching and research quality improvement in post-harvest technology and agro-food processing; iv) Educational capacity building for credit-based system and advanced training programs at Hanoi University of Agriculture; v) Establishing a remote sensing and GIS laboratory for education and research towards environmental planning and protection. At the meeting, Mrs. Le Thi Bich Lien, vice director of the International Cooperation Office, introduced about VNUA with 62 years of establishment and development. 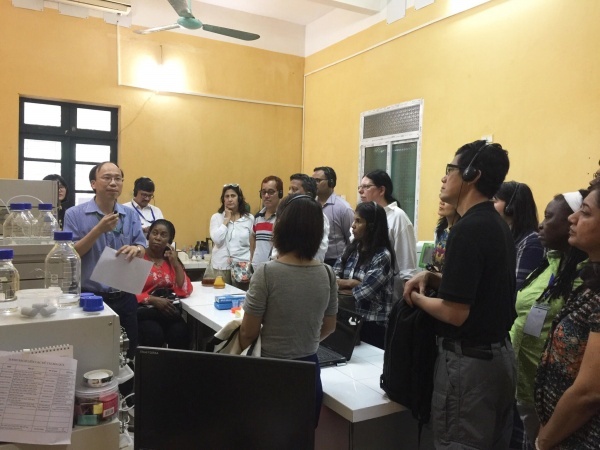 Vietnam National University of Agriculture has been providing high quality human resources, high-tech scientific products, technical procedures/progresses, and high quality and efficient plants and animals. It has contributed remarkably to the agricultural development of Vietnam and neighboring countries such as Laos and Cambodia. The TRIG Program, a part of the Educational Program implemented at the university from 2000 to 2012, was conducted during 2007-2012. It was evaluated by the World Bank as an effective and sustainable program. Indeed, the results of this program exceeded its original objectives: There were five doctors and 19 masters trained in developed countries, 61 lecturers and staff members participated in short training courses abroad, 36 research projects completed, 30 international articles, and 64 national articles published in prestigious journals, eight laboratories were equipped with advanced machines and several scientific and technological products have been produced with high practical values. With the aim of training human resources, VNUA sent 23 staff and lecturers to study postgraduate programs abroad. They all achieved good results, and returned to work at VNUA making huge contributions to the university in both research and training. Ms. Rebecca M. Oh shared that in some other countries, many educators did not return to work as committed. Thus, by coming back to work and contributing to the training of others, the project helps develop the university in meaningful and sustainable ways. Prof. Dr. Pham Van Cuong emphasized that the projects funded by international organizations such as JICA, the French Community of Belgium, and especially the World Bank, have contributed significantly to the achievements of VNUA. He thanks them for their support in improving the capacity of staff and lecturers, as well as the facilities for research and training at VNUA. On this occasion, he also thanked the World Bank for their assistance in training high quality human resources in order to develop the university sustainably. He strongly expects that the university will continue to collaborate and receive the full support of the World Bank in the near future. During the working visit, the World Bank delegation visited the Faculty of Food Science and Technology, one of the Faculties which received investment from the TRIG programs with modern facilities and equipment. It is worthy to note that this equipment is still being used for training and research activities of the faculty. At the end of the visit, the World Bank delegation highly appreciated achievements of the university in recent years, including the significant contribution from the TRIG program and they hope that VNUA will continue to prove its strengths and maintain its position as one of the leading universities in the country as well as become an international standard university in training and scientific research.